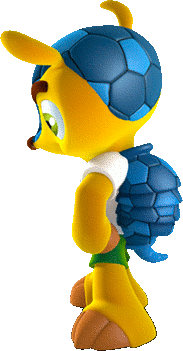 48% chose Fuleco as the name. The other choices, whittled down from a list of 450, were Zuzeco (31%) and Amijubi (21%), representing the themes azul (blue) and ecologia (ecology), and amizade (friendship) and jubilo (joy). You know, with hair like at a football/soccer game he's just asking to get kicked in the head. That is the idea . . . when they curl up, they are also shaped like a ball. The legacy of this choice will be the deaths of thousands of armadillos by kicking. There is also a live three-banded armadillo in the BBC World News video. When first seen, it is very difficult to tell that it is a rolled-up armadillo and not a soccer ball. When unrolled, it is quite hairy, but not on its head.